I have always loved good stories…all types of good stories; stories about people rising up from the ashes, people overcoming obstacles. My favorite type of stories is the romantic ones, ones with the God factor involved is the extra bonus that puts it over the top for me. Maybe you are a fan of the TV Show, Fixer Upper, like I am. 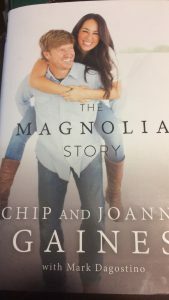 Maybe you also have been following the journey of Chip and Joanna Gaines. I love HGTV and this is one of my favorite shows on the network. This past Christmas season, my hubby and I fulfilled a lifelong dream of going to New York City together. Having the opportunity of walking through the STRAND book store in New York City was one of the items on my bucket list. They are known for being the store of “18 miles of books.” It was a super experience for a book lover such as me. The Magnolia Story was one of my many purchases that day. I actually just finished reading it too on January 2nd to be exact. I’m telling you THIS book and story was an excellent selection for the start of a brand new year. Their story encouraged my heart and helped to feed the fires of my own dreams and all I aspire to be and do. THANK YOU Chip and Joanna!! Several words and thoughts struck me in all the good ways. Their book contained many, many take-a-ways! *I got all teary-eyed learning of Chip’s beautiful conversation he had with his father. His dad supported Chip’s baseball dreams. He was all in since Chip was a young boy. So, when Chip came to the realization that his life purpose was taking him down a different path, he was a little nervous about letting his father know. *It was super cool to learn how my heart is similar with the Gaines’ hearts, our mutual love, admiration, and respect for all things old, in their specific case, old houses and everything in old houses. *Their parting words are all underlined in my book. This book and their words came to my heart in PERFECT TIMING. God knows just when you or I need special encouragement. You see, there are times when our dreams seem to be too big for our current life circumstances, the gap to wide from the here and now to the vision of what we feel and believe to be within our hearts. The waiting period can get very discouraging. Thank you, Chip and Joanna, for sharing your story. It was important to do so. Your words encouraged me in the most perfect way. Thank you. I know too that your book will touch many other hearts besides mine. God continue to bless you both and your family in tremendous ways! Your lives are a beautiful example and you are making a difference in our world today. Their book can be purchased where I love purchasing all of my reads, Barnes & Noble, and/or you can purchase this book directly from their website.